"There's not a whole lot to report. It was a pretty normal week last week," said Sgt Daniels. One citation for a DWI was written, to a female visitor in a golf cart. The fishing tournament was great, and no one needed reminding about how to act in public. "We didn't write any other tickets. The letters that were sent out to the school worked wonderfully. It looks like we're getting more compliance with small children being properly secured in golf carts," said Daniels. People starting their morning at Ocracoke Coffee Co. around 7 a.m. on Monday were startled to see a car overshoot the intersection and knock over the fire hydrant between the library and fire house. Ocracoke homeowner Willis Slane, delirious from a persistent, high fever, did not have his usual prudent judgement intact. "That was a medical issue," said Daniels. "We're not going to write a ticket for that." Slane was taken to the Health Center, where the staff "did a great job" and nailed a diagnoses of Rocky Mountain Spotted Fever, said Slane. Confusion is a frequent side effect. Bloodwork at the Outer Banks Hospital confirmed the diagnosis, and a CT scan assured Slane he's back to normal. At the time, in my mind, nothing was amiss, he said. Slane is incredibly grateful no one was hurt. The tick bite came several weeks ago, when he was vacationing in Arkansas. Rest assured, it was not a North Carolina tick, he said. 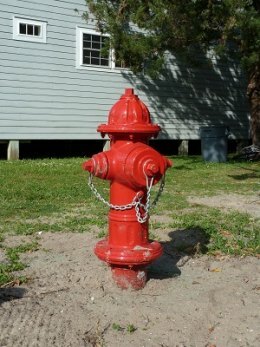 The damaged hydrant has already been replaced, supported by a donation from Slane. "He took me to see it. It's beautiful, very shiny and red," said his fishing buddy Kevin Hall. Officers are at the shooting range this week, completing the yearly training that qualifies them carry to side arms. Hyde police are issued .357 Sig Sauer pistols and 12 gauge shotguns. They can carry back up weapons, purchased with their own money, if they demonstrate competence using the additional firearms. Daniels is authorized to use his personal AR 15 with a .223 round, a civilian version of the M-16 rifle. This weapon would be employed if there is an incidence where officers needed greater range, he said. Since Hatteras ferries began running sporadically due to the shoaling inlet, "We've been down there every afternoon when they tell all these people they have to go back, that they're not leaving the island," said Daniels. Toothbrush stock at Ocracoke stores has been depleted by visitors unexpectedly spending the night. Daniels encountered some vacationers who just wanted to clean their teeth, and had them accompany him to his house, where he gave them his family's back up supply.